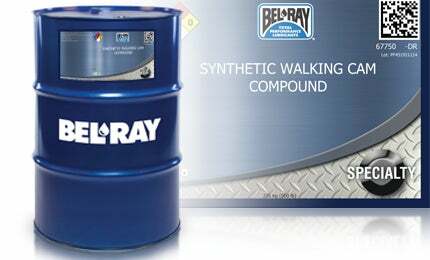 Synthetic Walking Cam Compound, commonly known as Bel-Ray Cam Compound L-55, is formulated to meet the lubrication requirements of the Caterpillar (Bucyrus) rolling cam mechanism on dragline propel systems. Synthetic Walking Cam Compound’s Extreme Pressure protection, combined with the strong film strength, ensures that the equipment maintains tough protection throughout use. It is formulated with a high concentration of low friction lubricating solids for an effective lubricating film on the cam and rail. Synthetic Walking Cam Compound can be applied through the standard L system, custom drilled frame system or manually to temperatures as low as -48°C (-55°F).